Well the good news is that Diana Reyna has broken free of the Vito Lopez machine but the bad news is that just means that she's an independent hack who isn't doing anything of value for Williamsburg. The main problem with Council Member Reyna is that she voted the end term limits for both the mayor and herself — that was really a decision that should have been given directly to the voters to New York City. The second problem is that Diana doesn't seem get the internet: When I emailed her about the term limits issue she never even replied. Her campaign website doesn't even feature an issues section so one can tell where she stands. Even if you wanted to contribute money to Diana you can't do it online, you have to download a Microsoft Word doc and mail her the check. But my gut feeling is that this inability to use the net isn't a mistake as one gets the feeling that Diana Reyna doesn't care what you think. - She claims to have secured over $20 million to create local jobs, but frankly I don't see the results. In fact during her stay in office the Pfizer plant closed in Williamsburg and those jobs aren't coming back. - She claims to have spent money on "anti gang programs" but these are just payoffs to local church groups who in return show up on primary day to vote her back in. - She talks about going after greedy landlords and while this may be the case in Bushwick I haven't seen any evidence of this with the luxury building boom in going on Williamsburg. - I get the feeling that Reyna doesn't know that Williamsburg exists because her main focus is on Bushwick. 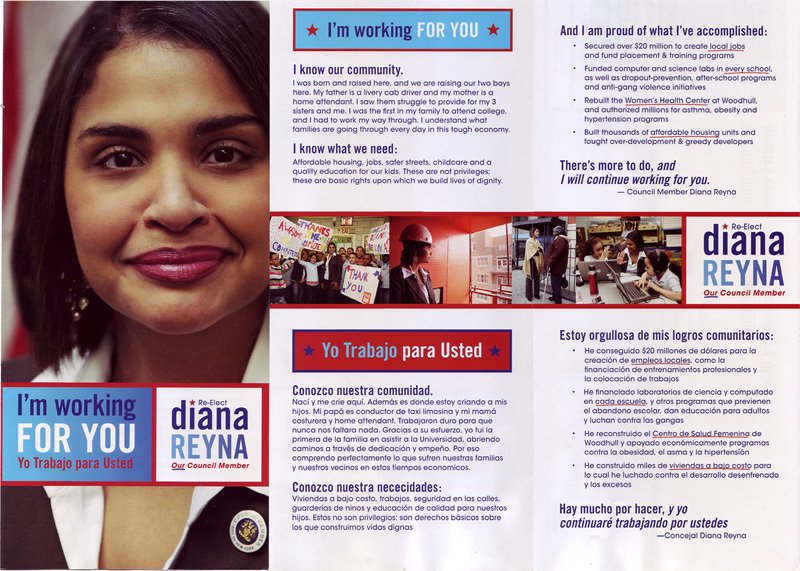 For example her campaign literature is in Spanish but not Hebrew or Yiddish to reflect the full diversity of the district. 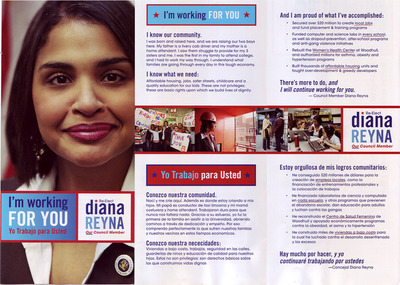 Endorsements for Diana Reyna come from Congresswomen Nydia M. Velázquez who didn't endorse President Barack Obama when it mattered (by the way that hurts this district when it comes time to fund projects). Her main "union" endorsement come from the Teamsters who have a track record of backing Republicans at the wrong time. Is she the George Bush Jr. of Williamsburg? Hell no, in fact aside from being a political hack (which is not a crime) she isn't the "worst person in the world" — but I think Williamsburg deserves better. Therefore I ask everybody to not vote for her in the primaries to send a message that she should have allowed voters to have a voice in term limits. This page contains a single entry from the blog posted on July 4, 2009 8:16 PM. The previous post in this blog was Three Ways to a Sunset. The next post in this blog is Maritza Davila: She's the Choice of the Machine (Which is Why You Shouldn't Vote for Her).